Built as part of the LEGOLAND California Resort complex in Carlsbad, California (but requiring its own admission ticket), Sea Life Aquarium is an interactive attraction that allows visitors to explore a variety of sea habitats and learn about protecting ocean life. Owned by the same company that operates LEGOLAND (U.K.-based Merlin Entertainments Group), this attraction opened in 2008 to become the brand's first location in North America. Sea Life Aquarium is intended to introduce visitors to a variety of marine animals and habitats in an exhilarating and hands-on way. LEGOs are incorporated throughout the exhibits, making a uniquely appealing learning environment for children ages 2 through 12. 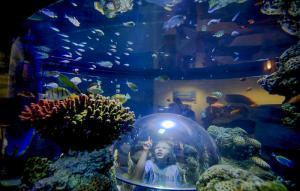 The two-story, 36,000 square-foot aquarium shows more than 30 displays of marine life. The exhibits are all bright, attractive, and compelling, making a visit to Sea Life incredible fun. Of course, LEGOs play a big part, making up decorations in many of the environments and even inside the aquarium habitats. LEGO swimmers, divers, undersea exploration vehicles, and other elements are found in many of the tanks. 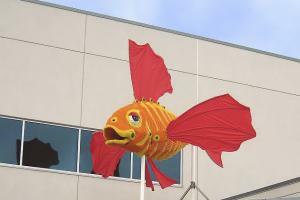 At the entrance, which is beautifully guarded by a giant LEGO fish, children can pick up a scratch card for the Sea Life Quiz Trail. This allows them to answer quiz questions throughout the exhibits, scratching off selections on their own card, to see if their answers are correct. The quiz questions are interesting and as fun as they are educational, often inviting children to look, touch and feel as well as think. The newest exhibit, Jellyfish Discovery, opened in the spring of 2014 featuring more than 100 jellies lit up by spotlights in cylindrical display tanks. Visitors get a great view of these graceful creatures and can learn more through interactive elements, such as how they seem to dance in water. Gold Rush River - After a brief orientation video, visitors are first met with a short slide for kids through an imitation tree trunk. Here the journey starts with the aquarium's largest fresh water display, replicating the fresh waters of the High Sierra Nevada Mountains. The open tanks feature fish species native to California lakes and streams. San Francisco Harbor - Next stop is the harbor area exhibit with a nautical theme on the bay of San Francisco. Board the bow of the boat for walk-up viewing, and peer through the plastic kids-eye level window bubbles for a closer look. The tanks feature rays, leopard sharks and other close-to-shore creatures. The daily diver show takes place here with interaction through the glass. The display is also the home of the Giant Pacific Octopus, the largest type in the world, where you can watch it solve puzzles and play with toys (don't miss its weekly fascinating feed show). California Coast - This display showcases California's rocky coastline, bringing to life the low tanks with colorful flower-like sea anemones and sea stars. Lost City of Atlantis - A 35-foot walk-through tank with impressive Atlantis theme, this ocean tunnel features a 10-foot-tall, 1,700-pound statue of Poseidon, and a seven-foot-long LEGO submarine and diver made of thousands of bricks. 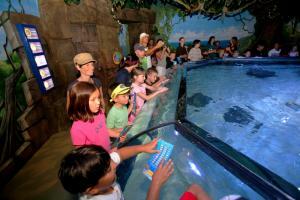 Visitors come nose-to-nose with all kinds of sharks, rays and tropical fish. The 200,000-gallon submerged kingdom is by far the largest tank of the facility. Ray Lagoon - An octagonal-shaped open tank of the winged sea creatures, this exhibit features several species of rays that appear to fly through Mayan ruins. You'll want to check out the daily ray feeding show each afternoon. Kingdom of the Seahorses - These beautiful wall tanks feature a variety of tropical seahorses. The daily seahorse feeding show offers additional information about the tiny endangered creatures. Discovery Zone Touch Pool - A safe opportunity for kids to touch a wide variety of sea life, the Discovery Zone Touch Pool is staffed by education experts from the aquarium. Hermit crabs, live sea stars and everything else found in the touch pool is safe to handle. More than 200 species can be found at Sea Life Aquarium, which translates to over 5,000 individual aquatic animals. Some highlights include the more than 50 sharks that call Sea Life home, such as zebra sharks, black tips, and white spotted bamboo sharks; watch them swim over you as you go through an underwater tunnel in the Lost City of Atlantis. Visit rays in a hidden temple of the ray lagoon and admire seahorses in their own kingdom. Make sure to check out the giant Pacific octopus and the moon jellies in the Sea Life Lab. You can even feel some of the creatures, both in the touch pool and tide pool. Get hands-on with sea stars, sea hares and more touchable marine life. Hand wash stations are conveniently located for use after your close encounters! Sharing an entrance with the adjacent LEGOLAND theme park, Sea Life Aquarium is close to the 5 Freeway, just north of San Diego. Tickets can be purchased to just the Sea Life Aquarium or as a package with LEGOLAND park tickets. Tickets can be purchased at a walk-up price for $22 per person for same-day use, or buy at least seven days in advance online for $18 per person (pay only $20 each when you reserve two to six days in advance). Sea Life is devoted to conservation efforts, increasing awareness of the importance of protecting marine life. To this end, Sea Life promotes "Breed, Rescue, Protect" activities worldwide. Its partner organization, the Sea Life Trust, is a registered charity established by Merlin to further champion the cause of global marine conservation and the environment. 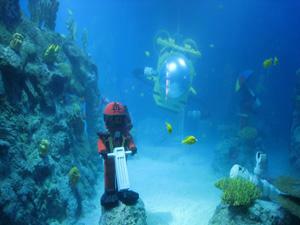 The Sea Life Aquarium at LEGOLAND is a unique interactive aquarium offering rich experiences for visitors of all ages. 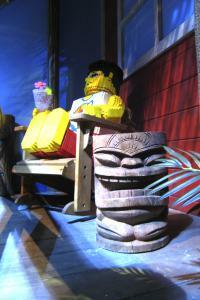 Colorful, fun, and educational, the park is perfect for a visit for anyone interested in LEGOS, marine life, or both. There are over 40 Sea Life Aquariums in the world (mostly in Europe), including London, Paris, Bangkok, Auckland and others. The California property is one of eight locations in the U.S.